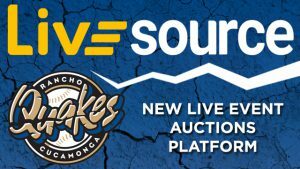 San Diego, CA – The Rancho Cucamonga Quakes and LiveSource, LLC are pleased to announce a new partnership to utilize the latter’s in-the-moment mobile auction platform starting in the 2018 baseball season. The Quakes will be using the LiveSource mobile app to offer fans opportunities for charitable auctions, unique memorabilia, and fan experiences. “Improving our fans’ experience is very important to us. It was LiveSource’s eagerness to grow with us and create a new user-friendly auction experience that ultimately led to our partnership. We believe this platform will improve the experience for both fans at the ballpark and extend to those unable to attend. Now fans will be able to participate in auctions by placing bids from their seats simply using their phones, never missing a moment of the game. We are excited to see the app lead to increases in the contributions we are able to make to the various charitable organizations in our community,” said Chris Pope, Assistant General Manager- Sponsorships. Founded in 2016 by Scott F. Levin, the LiveSource platform gives fans in attendance and at home the ability to bid on items and experiences that become available during an event. Bidding, winning, payment and delivery is all facilitated on mobile devices through the LiveSource app and website. This technology enables partners to surprise and electrify fans with unanticipated opportunities as LiveSource partners can react instantly to initiate auctions for the fans while they are most excited – right then and there during the event. LiveSource auctions will allow Quakes fans to support and connect with the team in a fun and exciting way by gaining in-the-moment access to authenticated memorabilia and experiences. By monetizing fan experiences and game memorabilia, LiveSource will create new avenues for quality fundraising that don’t necessitate months of advance planning and preparation. The LiveSource software is simple and easy to use, and it handles the entire sales process from posting to payment to arranging delivery. The Quakes 2018 season begins with Opening Night at LoanMart Field on Thursday, April 12. For more information on the Quakes upcoming season and ticket packages, visit rcquakes.com.